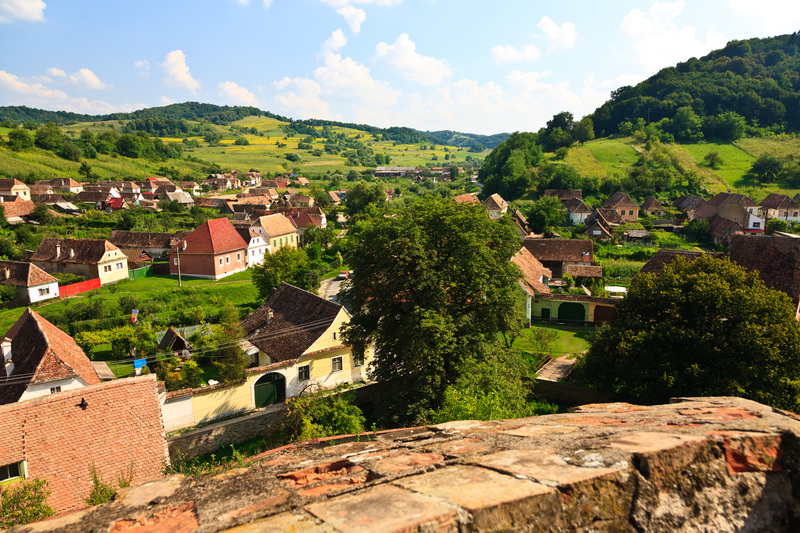 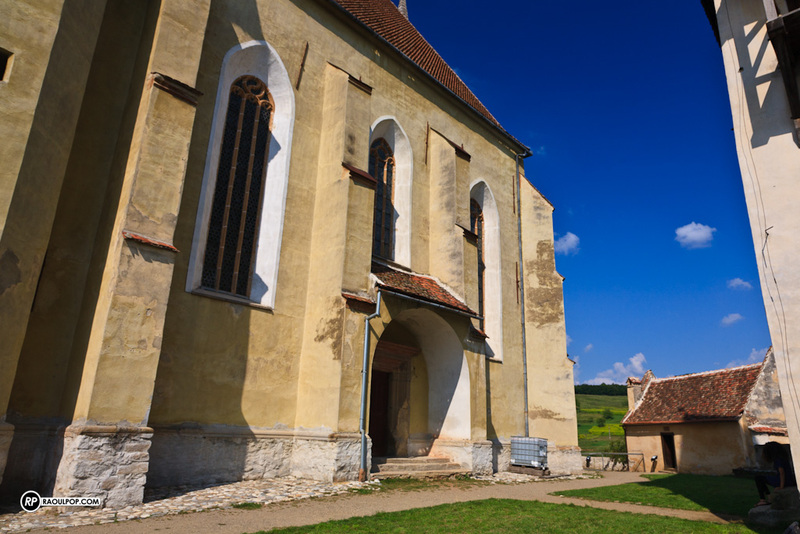 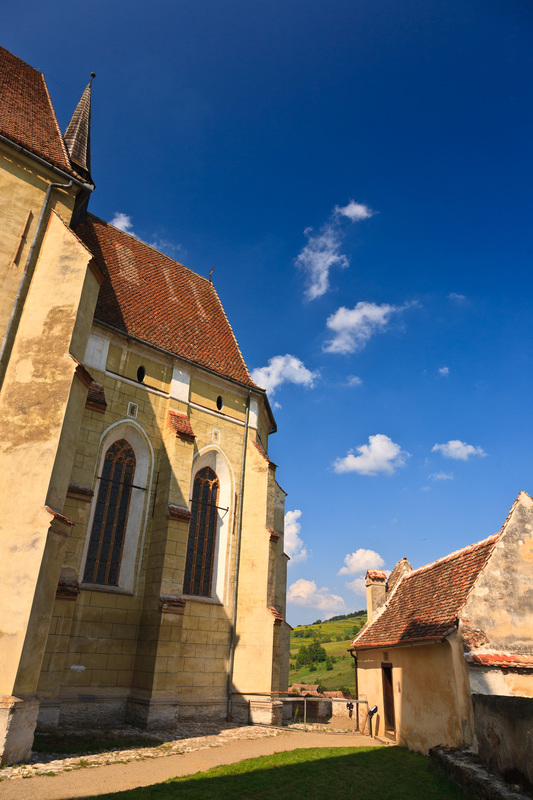 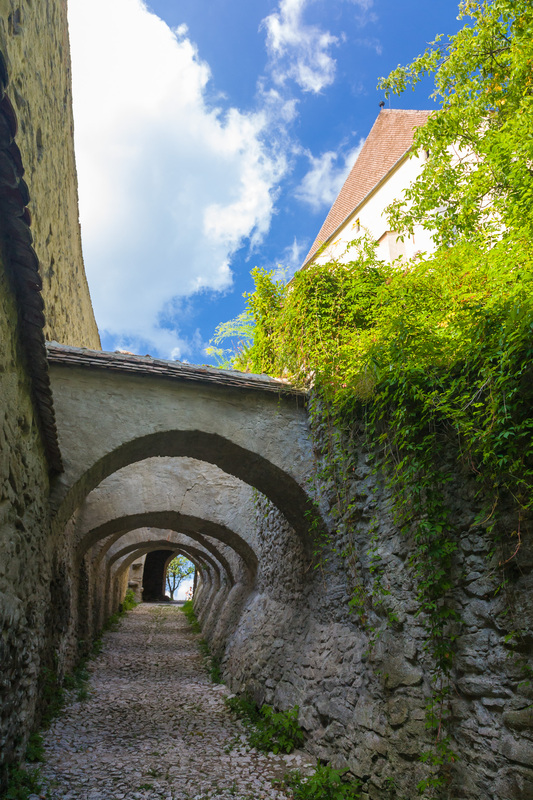 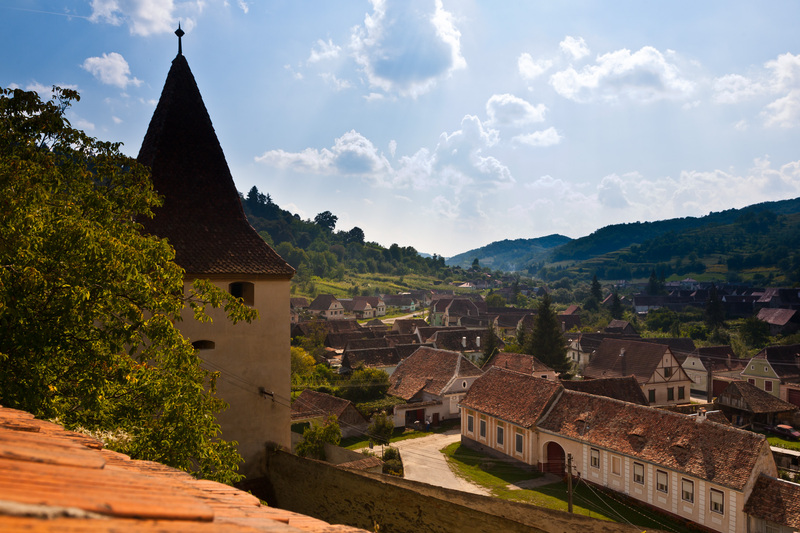 The village of Biertan has one of the most renowned fortified churches in Transilvania, Romania. 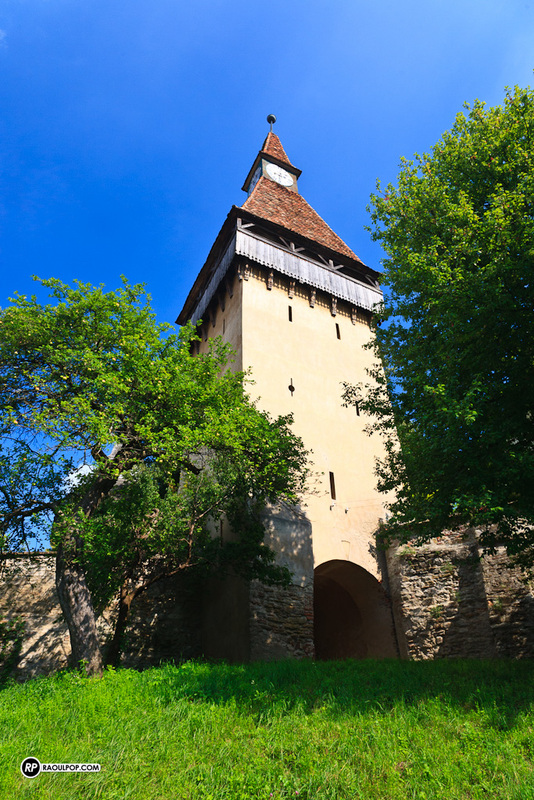 Built between 1493 and 1522, over the site of a previous church, it is contained within two concentric fortified walls, with seven towers and two bastions. 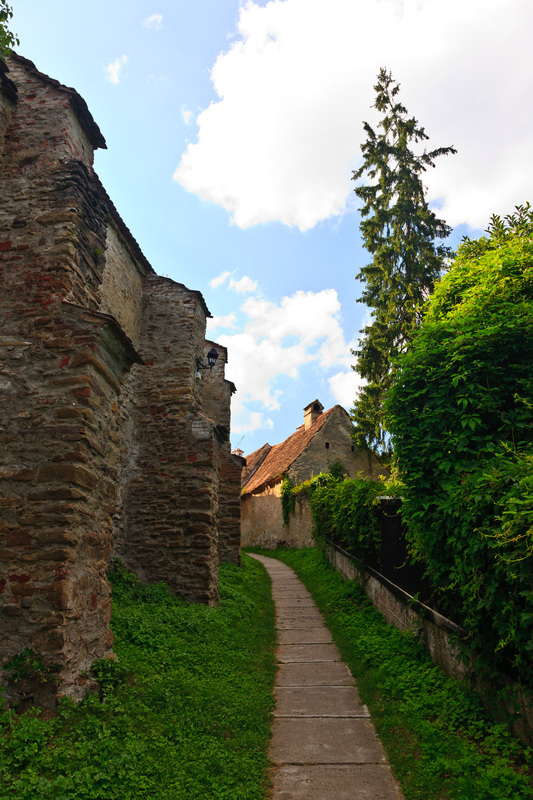 The village itself has maintained its medieval character: the two roads that lead into it are the same they’ve always been; most of the houses, particularly in the village center, still have the same architecture, and you’ll be hardpressed to find but a few modern buildings there. 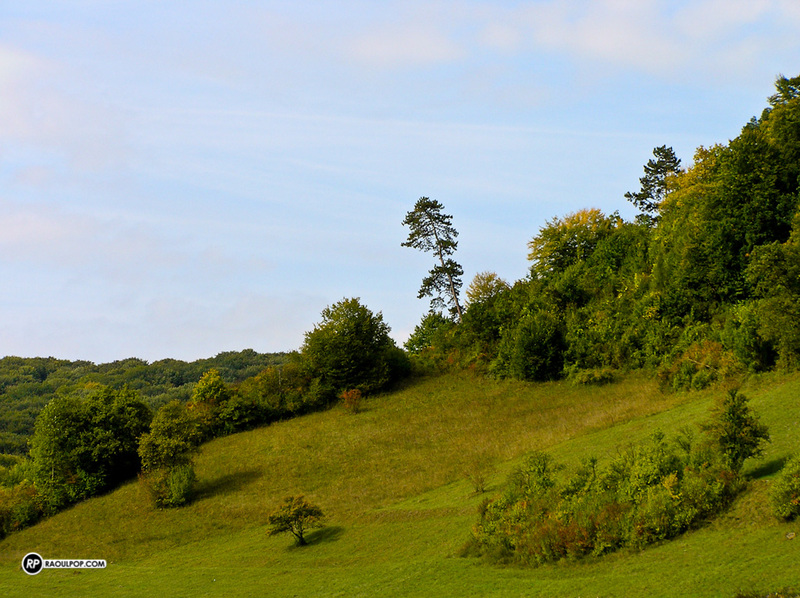 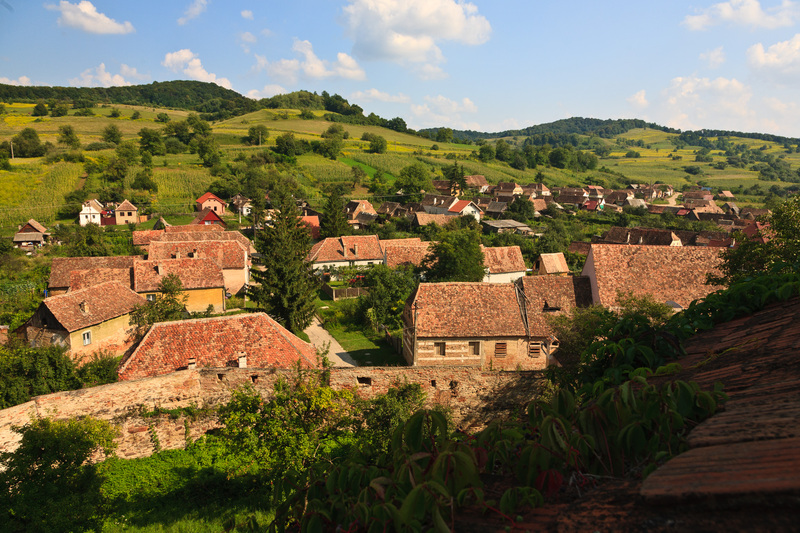 You get to it by driving through gentle rolling hills and crop fields. 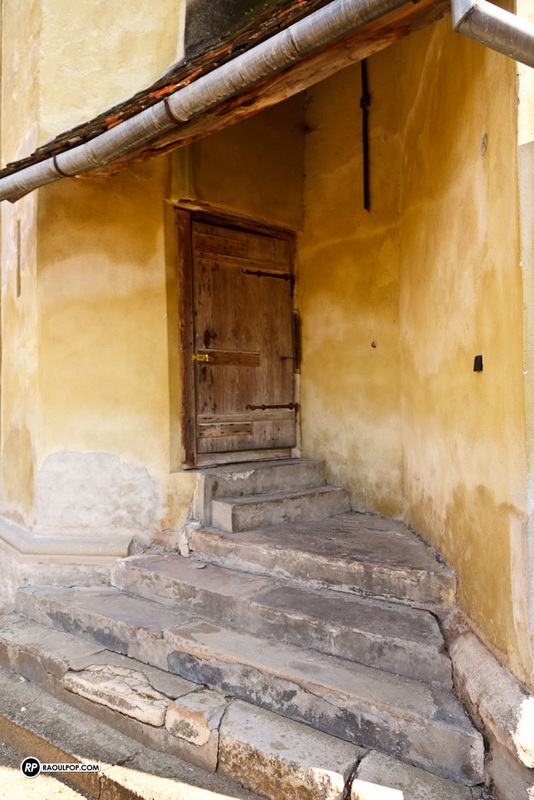 Forgotten by time (and by modern real estate development), it’s as if you’re going back through time. 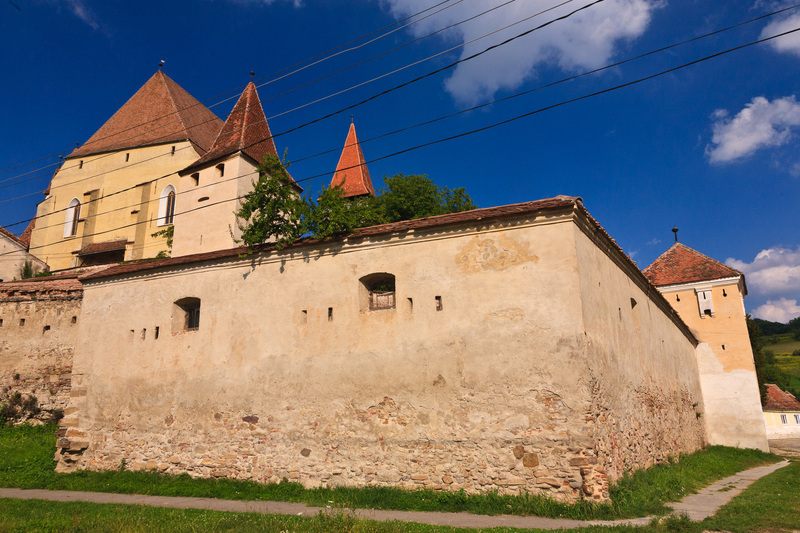 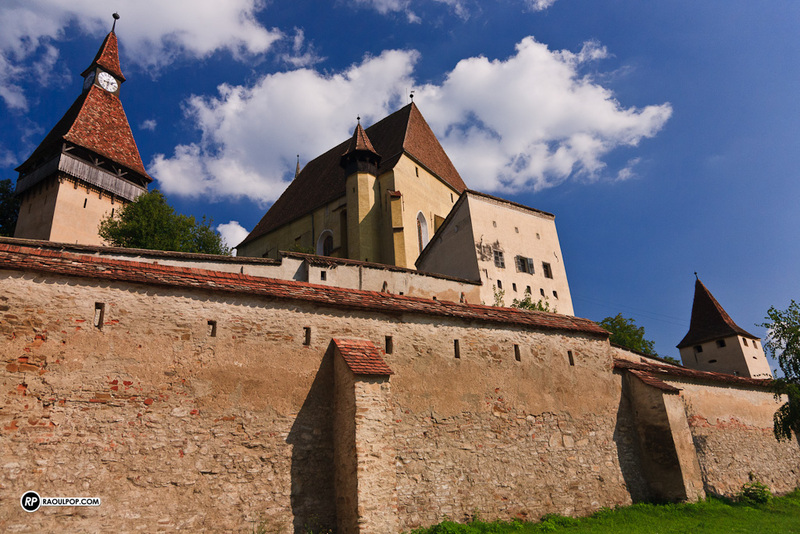 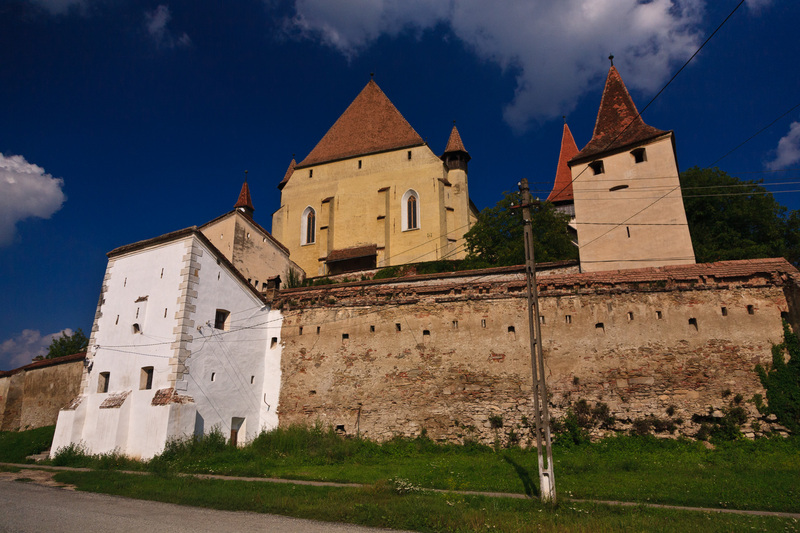 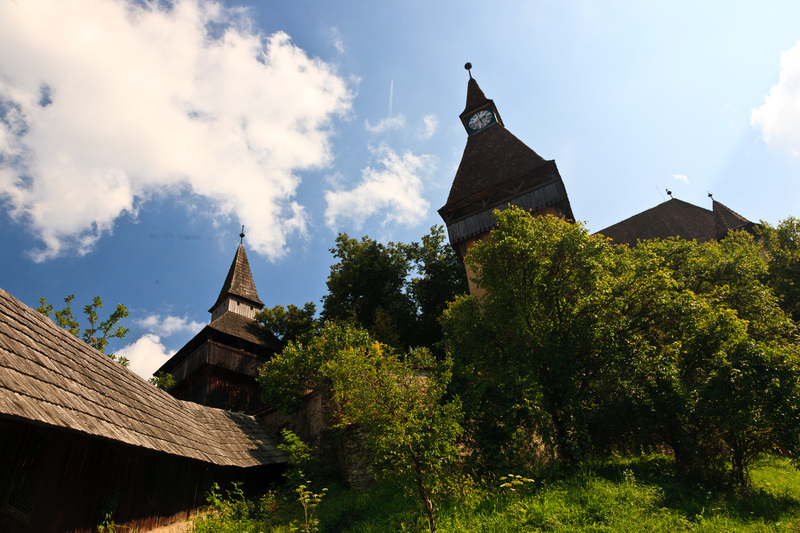 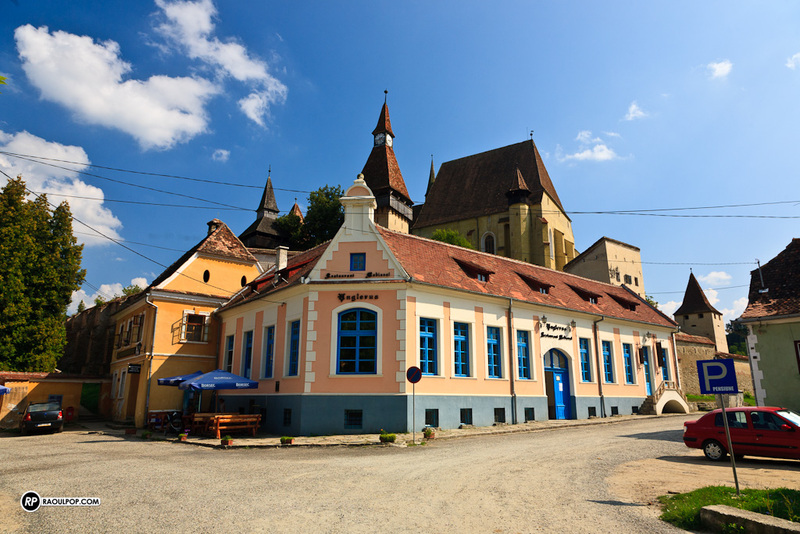 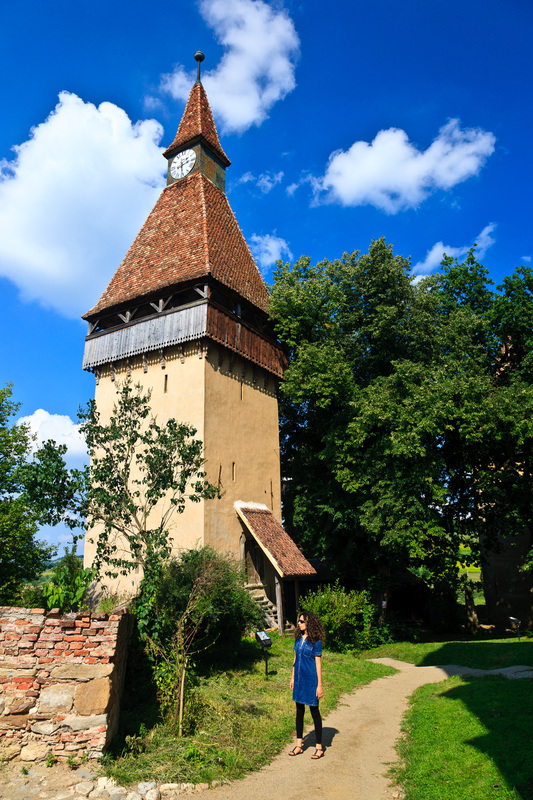 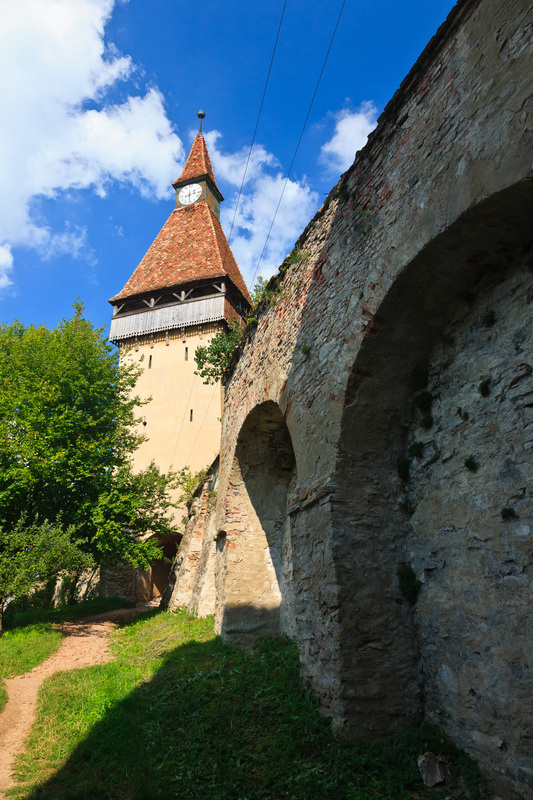 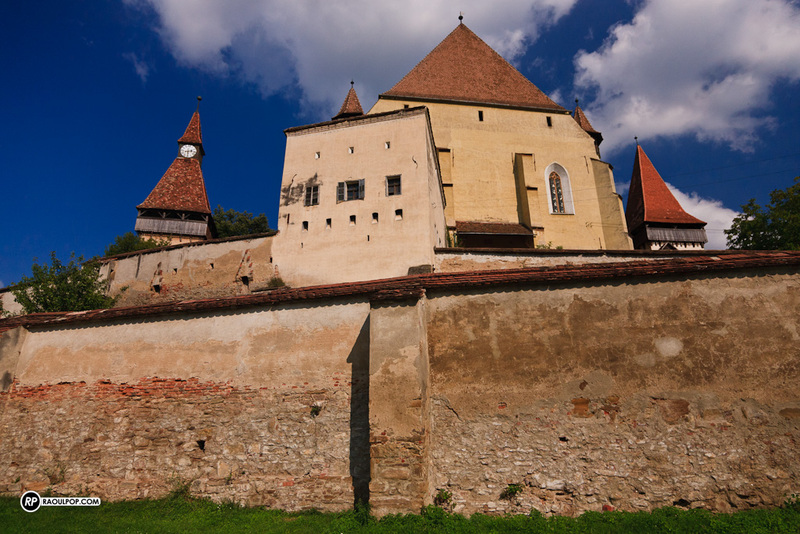 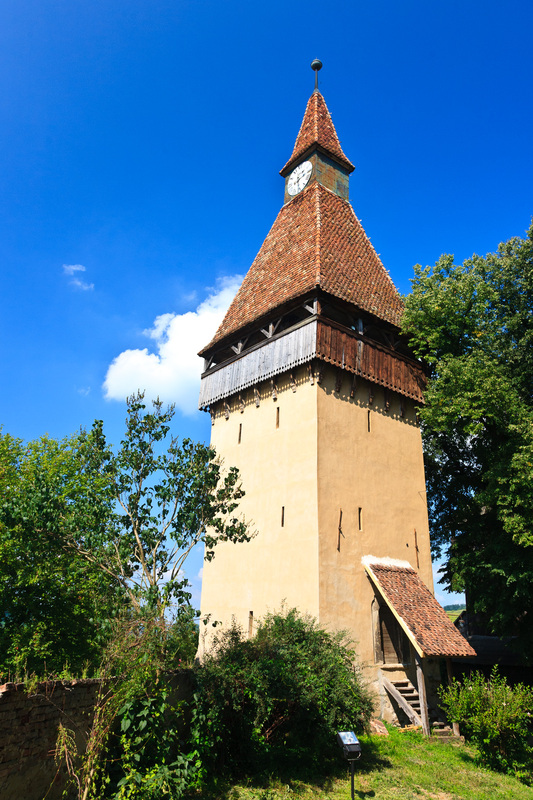 The fortified church stands in the geographical center of the village, right next to the spacious, riverstone-paved village square. 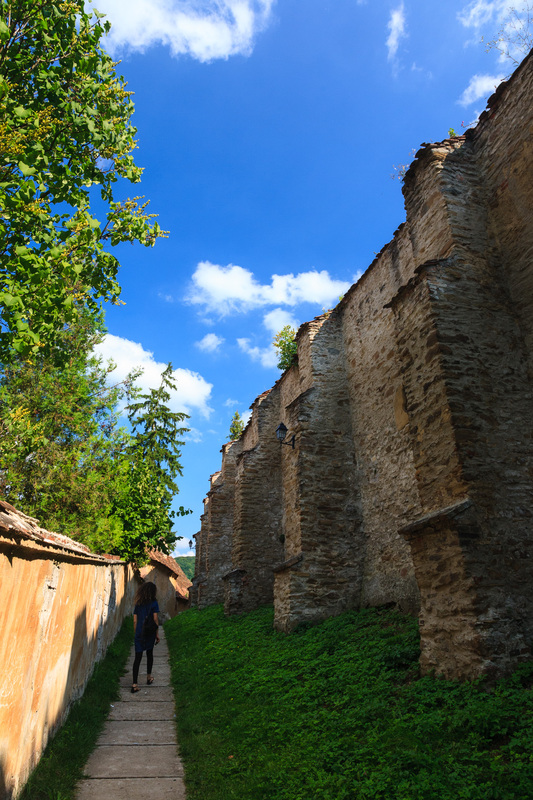 It’s a good idea to take a walk around the outer fortified wall before going in, to get a sense of the place and its layout. 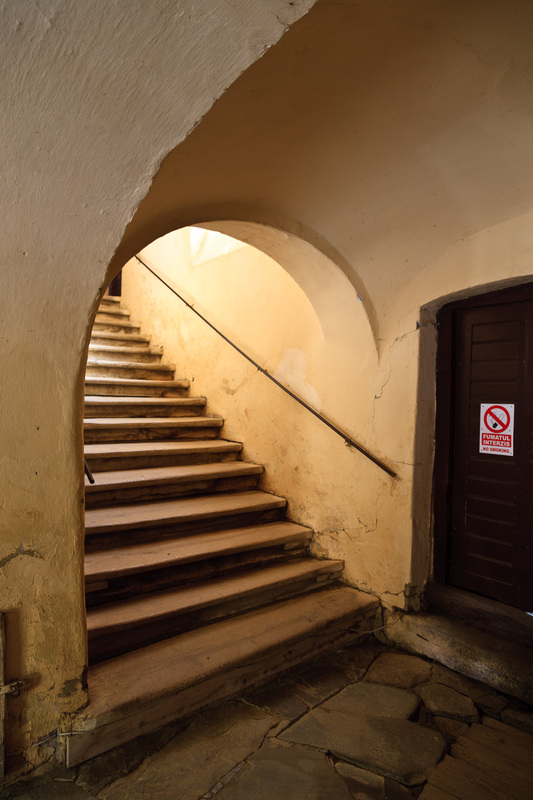 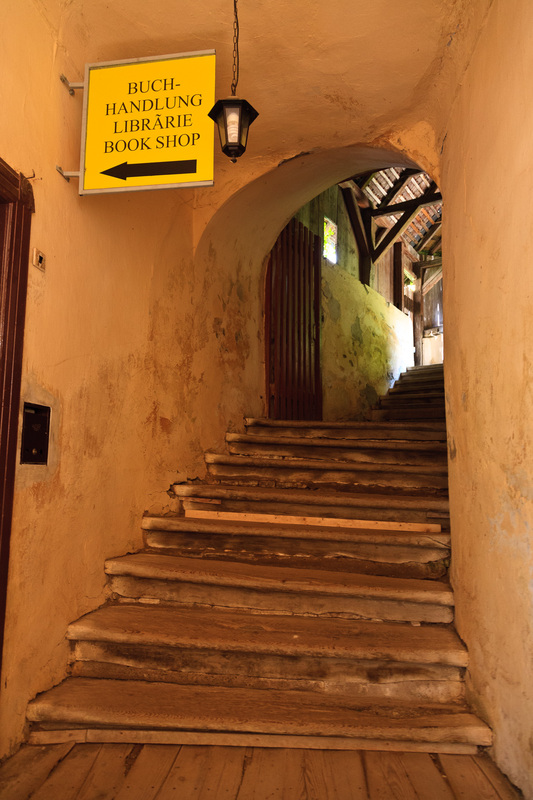 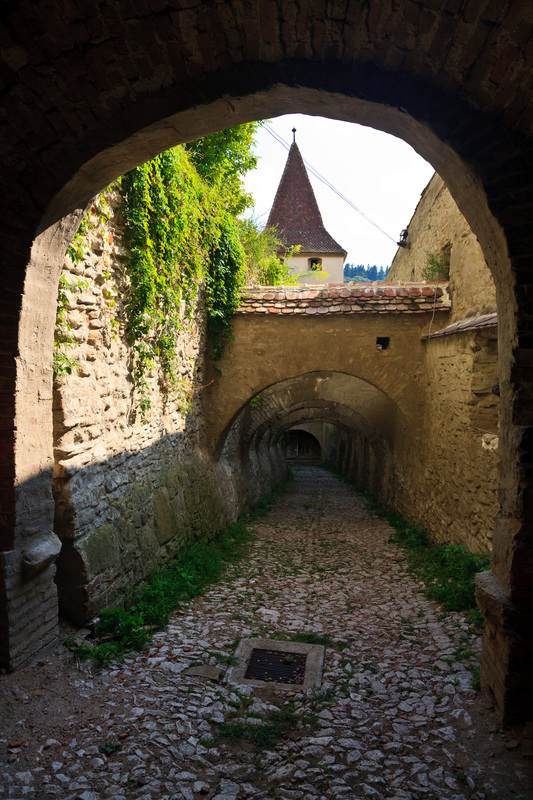 The current entrance into the fortified walls is through an arched passageway with a long row of steps up the hill, which leads inside the inner courtyard. 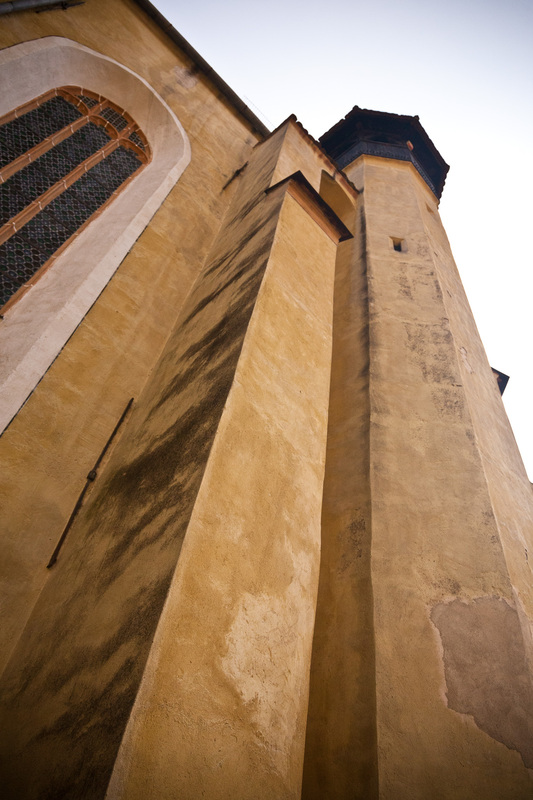 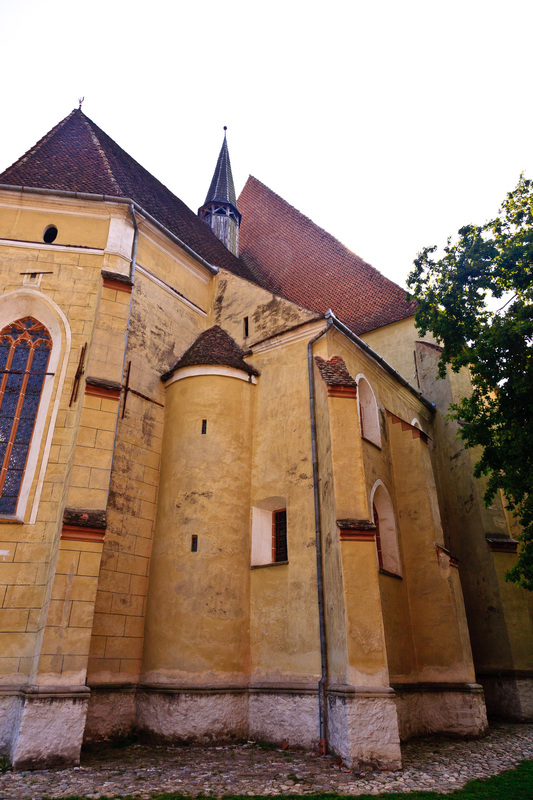 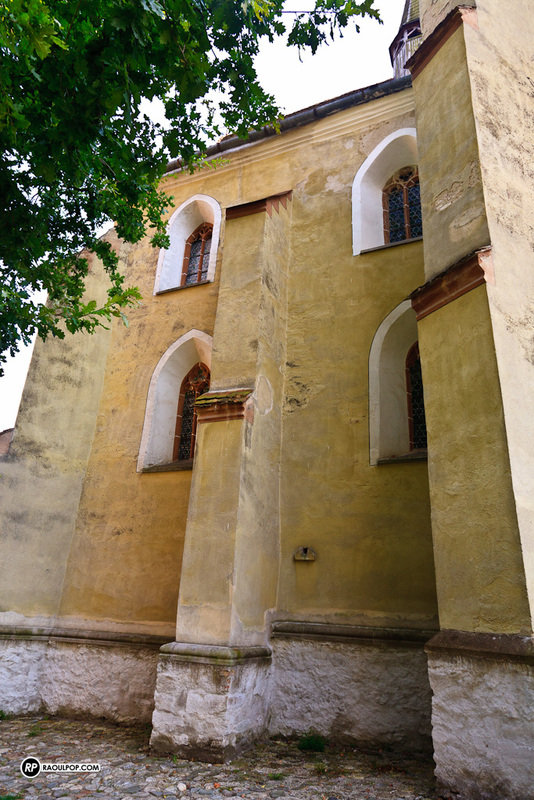 The church itself stands on top of the hill, inside the inner courtyard. 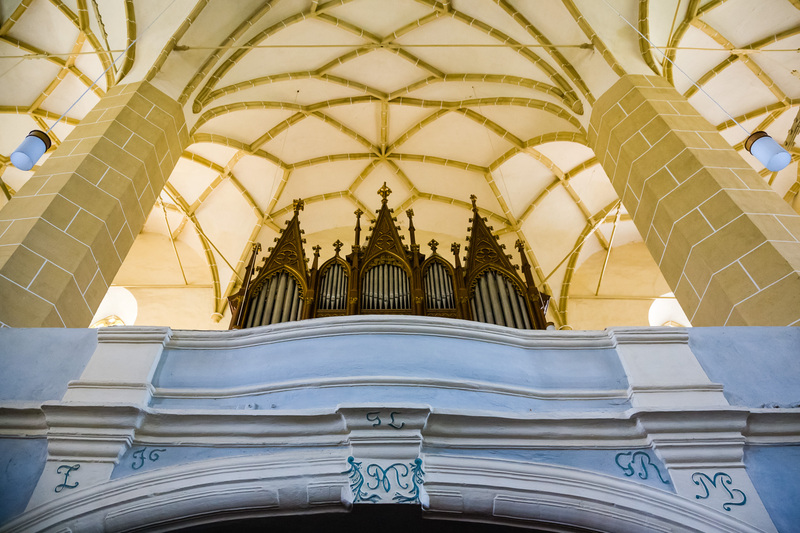 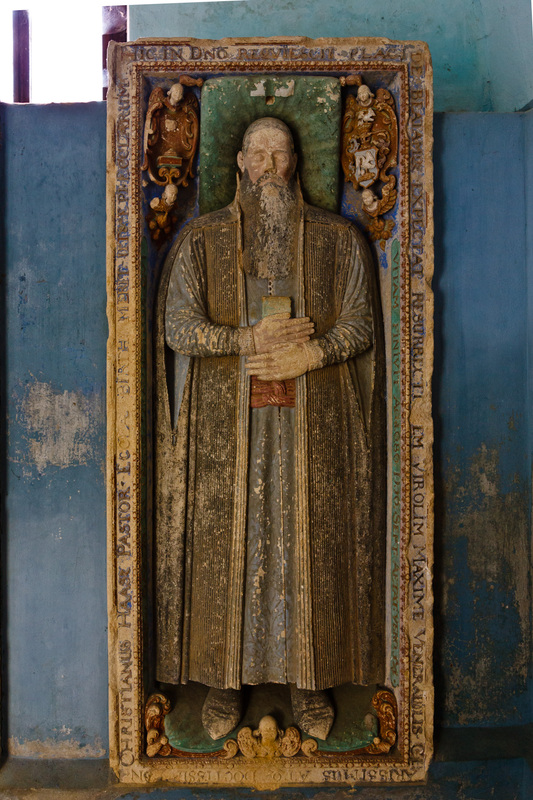 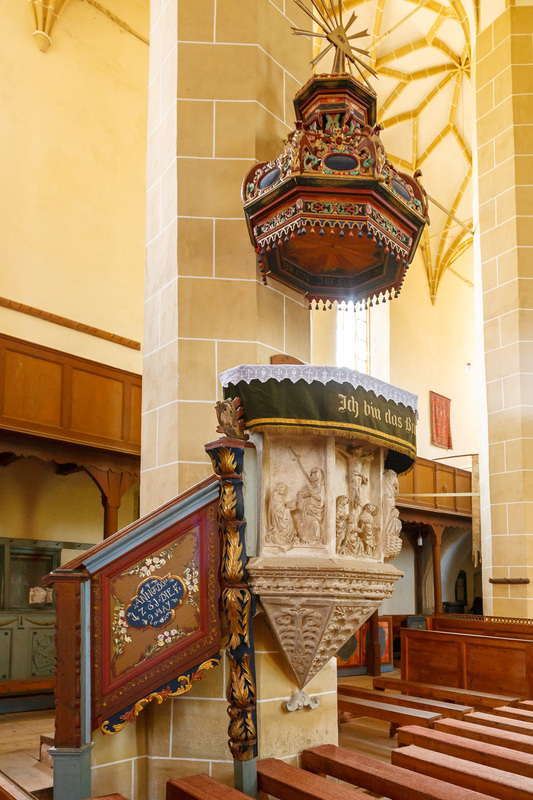 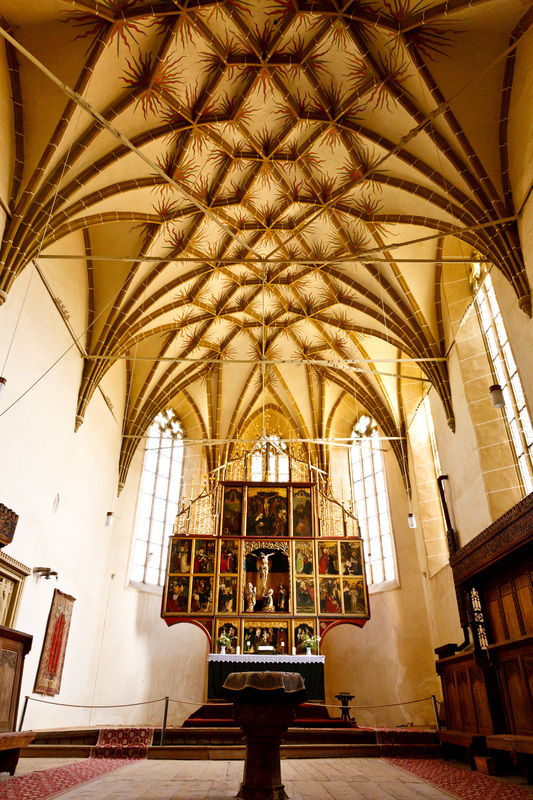 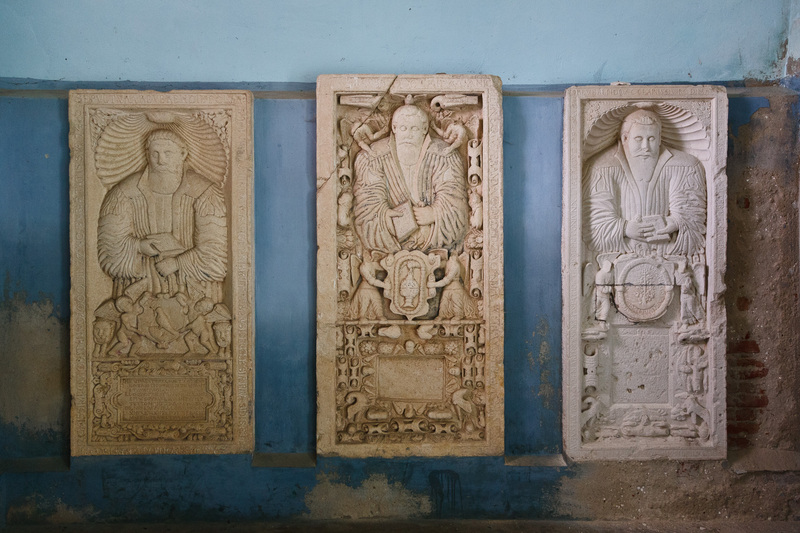 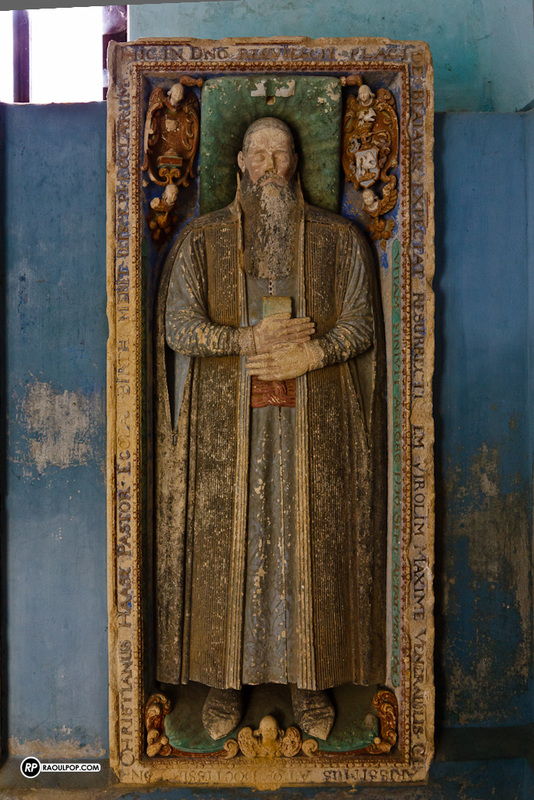 The exterior and interior have been stripped of the sculptures and decorations seen on other period churches, as became the custom with Reformed churches, which shunned what they saw as “excessive decoration” and actively destroyed the relics which reminded them of the “old religion”. 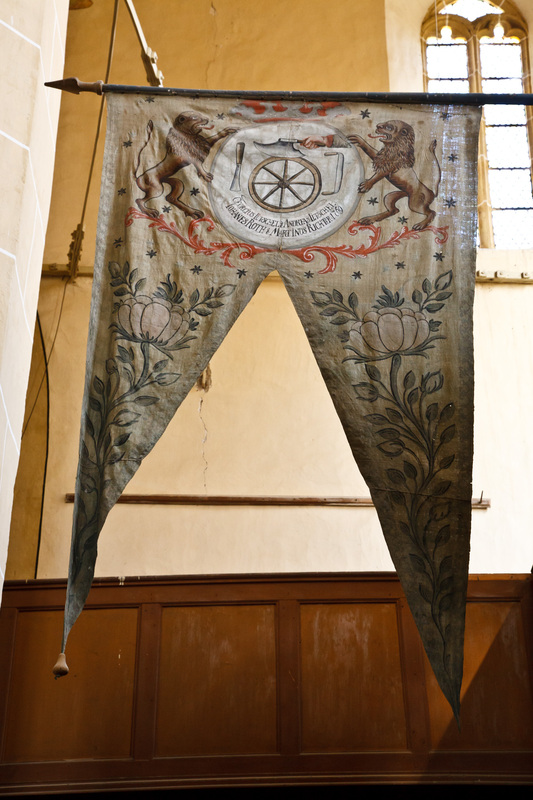 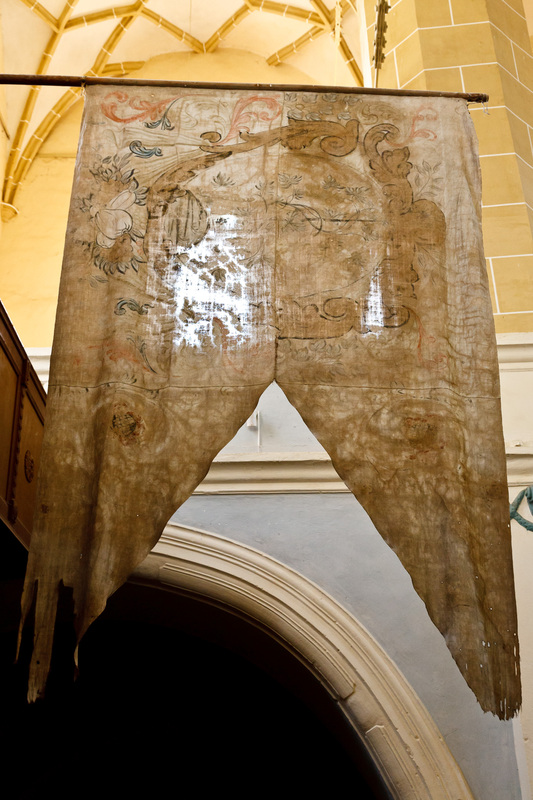 Certain delicate motifs endured though. 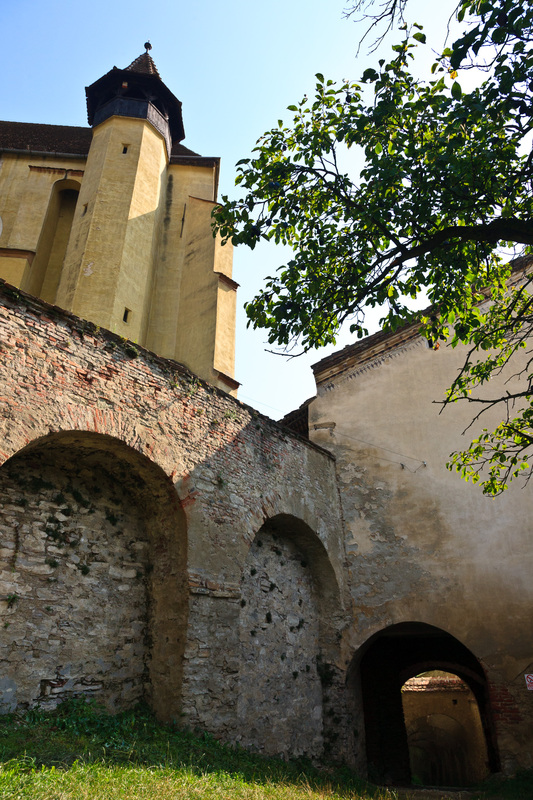 The inner courtyard affords beautiful views of the village, made even better from the vantage point of the towers and inner walls. 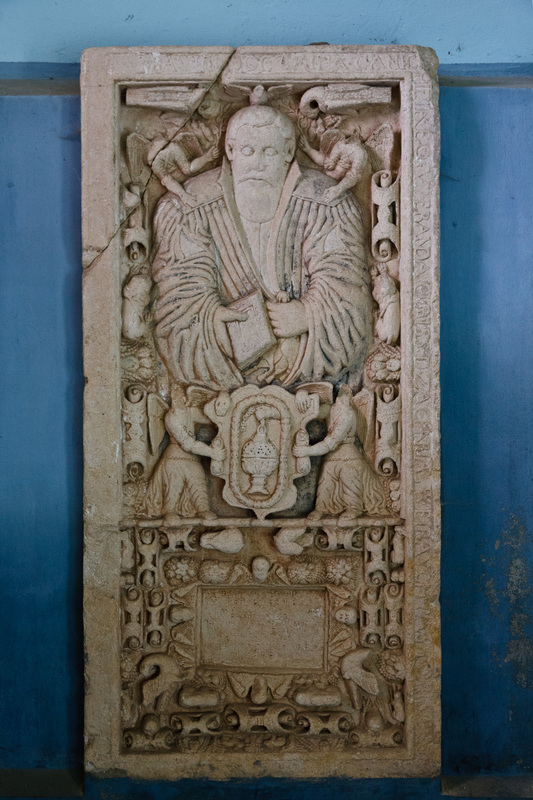 Some aspects of the church and village life are preserved through exhibits, such as this gravestone for a religious notable, or tools of the trade for a carpenter. 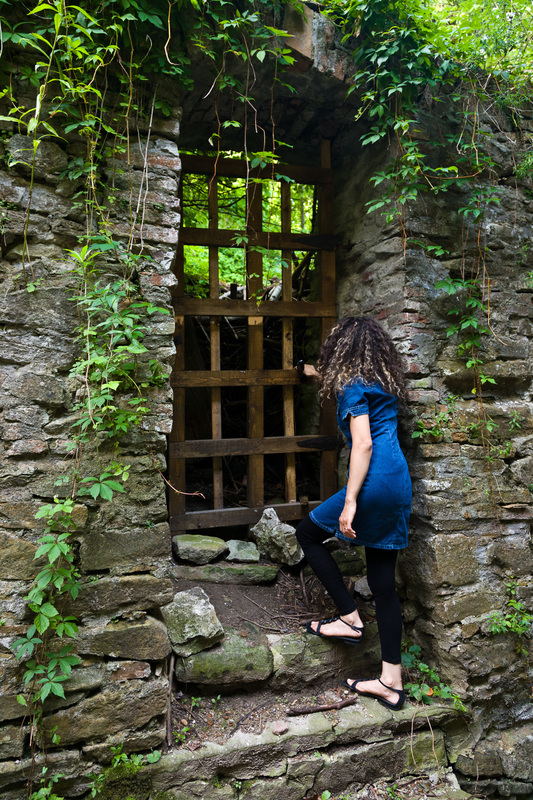 Don’t forget to explore the space between the inner and outer walls, which I think is the most romantic of all. 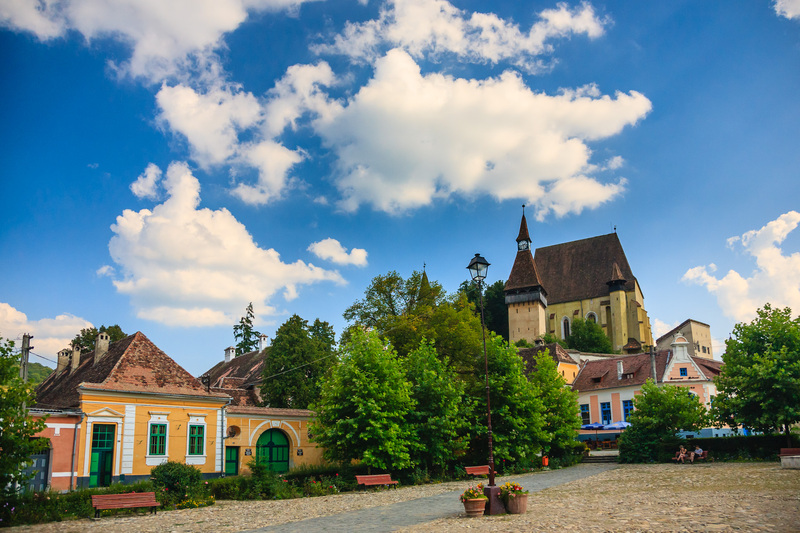 Courtyard inside the inner walls, Biertan, Romania. 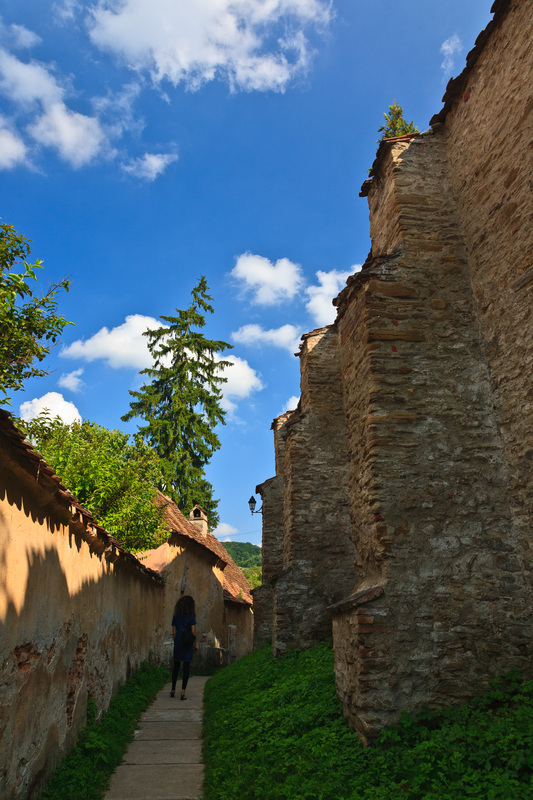 Outside the walls of the fortified church in Biertan, Romania. 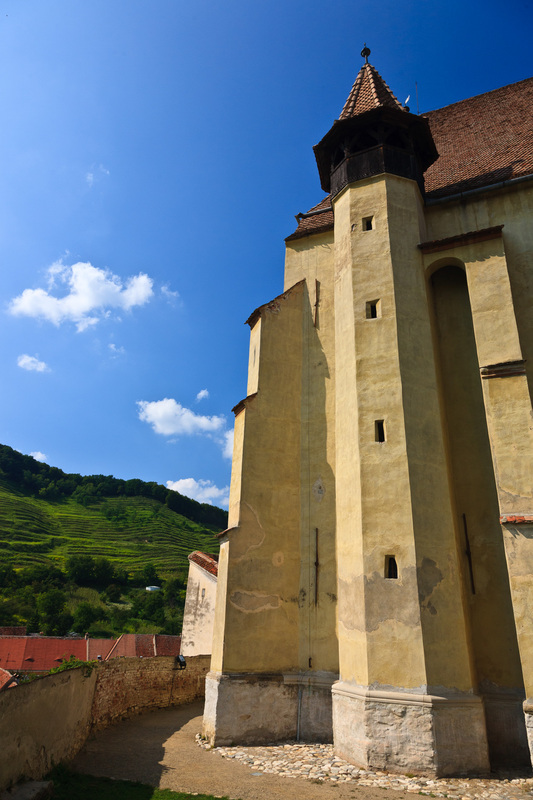 Inside the church, Biertan, Romania. 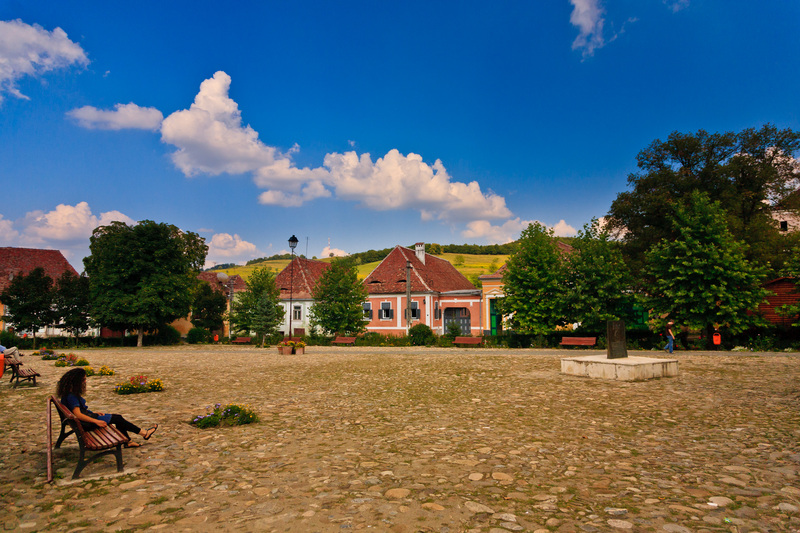 Village square, Biertan, Transilvania, Romania. Between the inner and outer fortified walls, Biertan, Romania. A view of the village from inside the inner walls, Biertan, Romania. 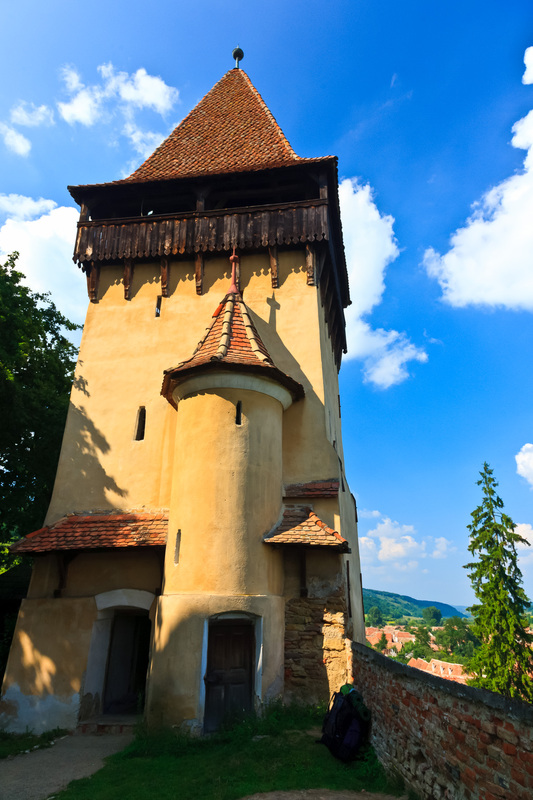 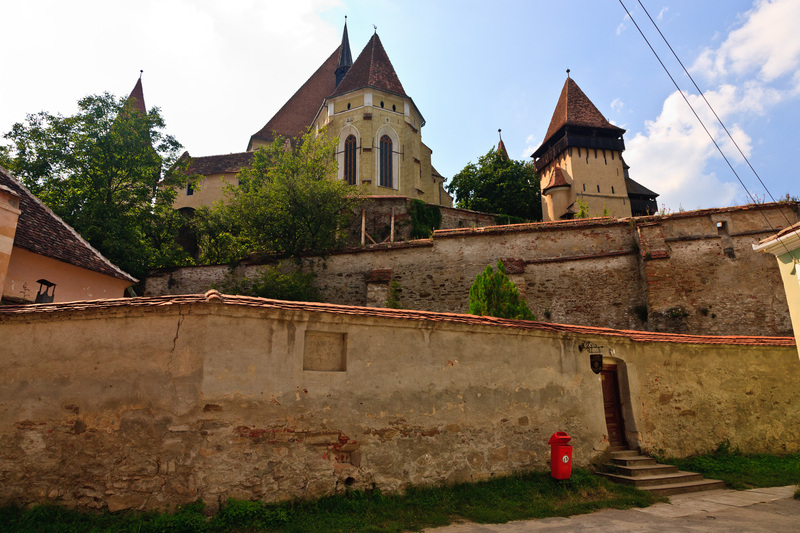 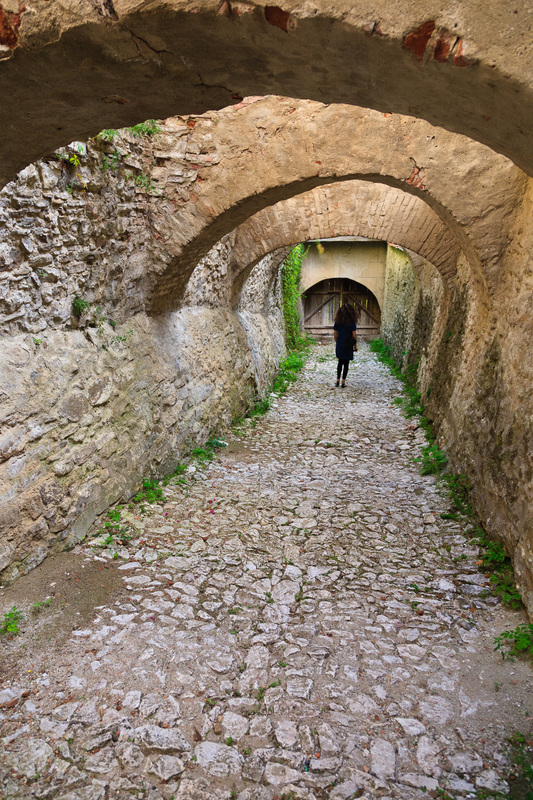 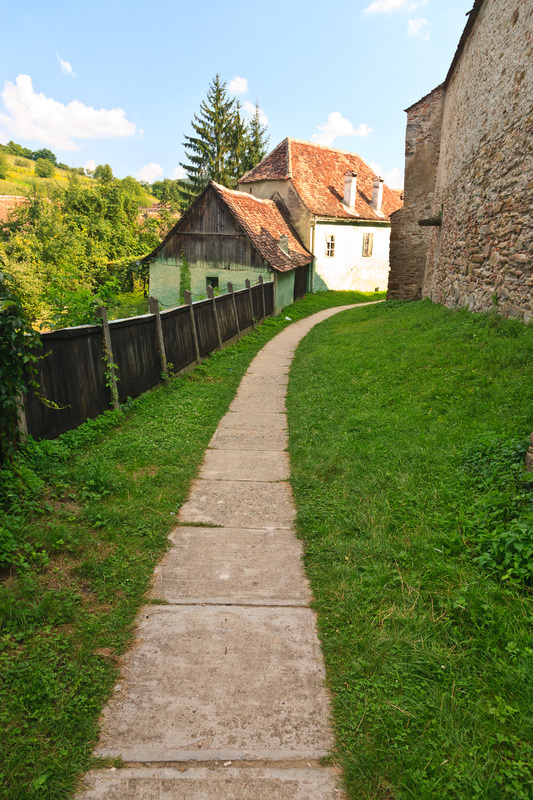 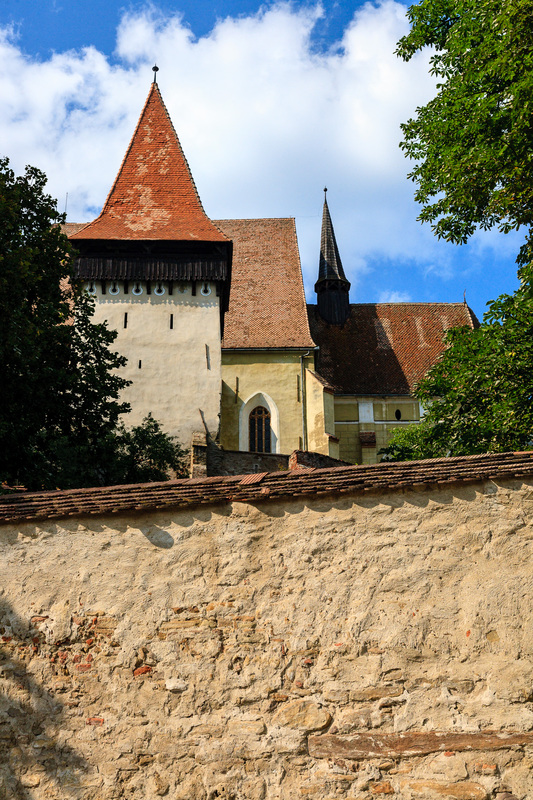 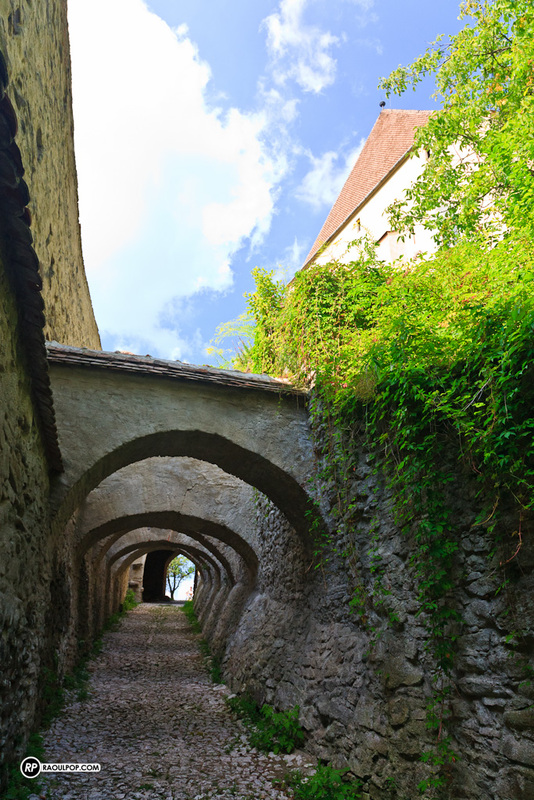 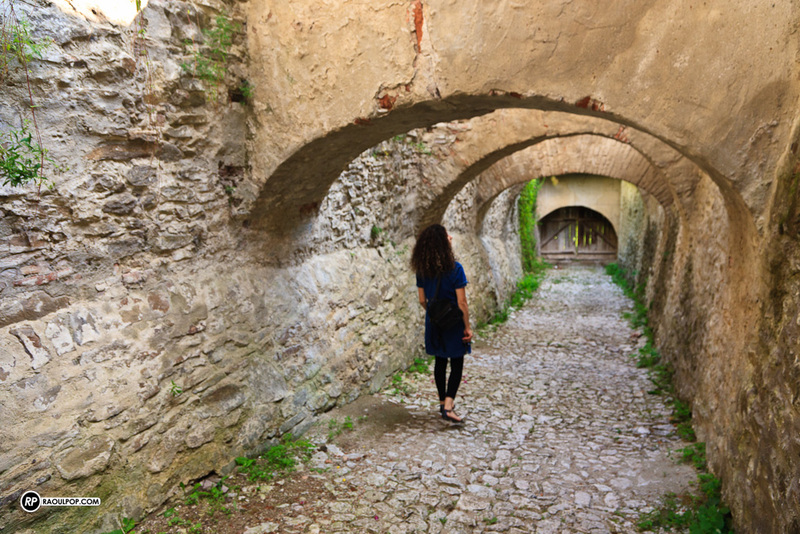 Outside the walls of the fortified church in Biertan, Transilvania, Romania. 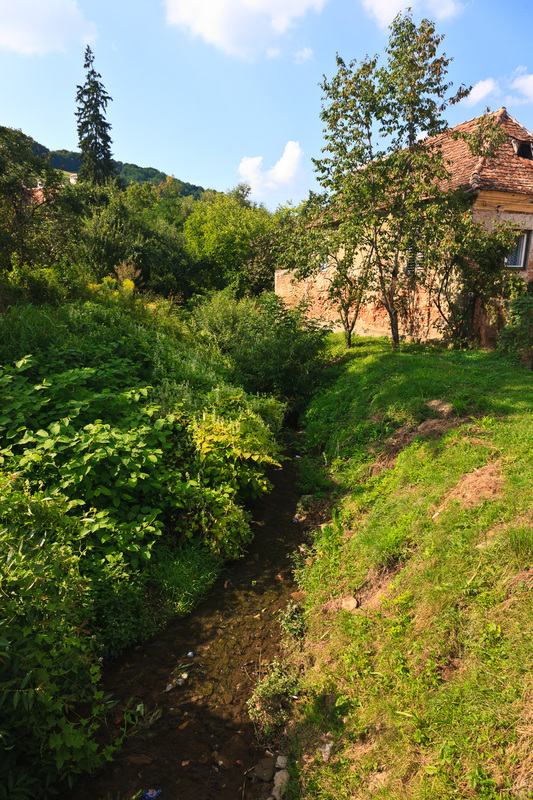 The village brook, Biertan, Romania. 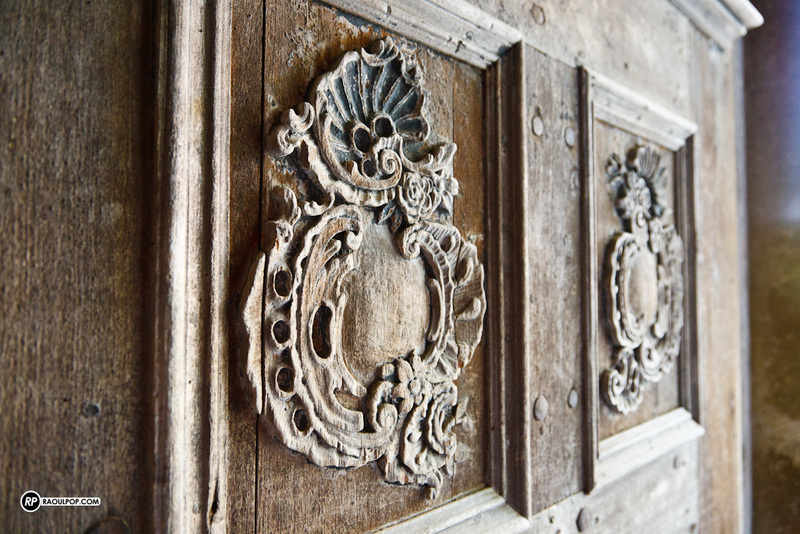 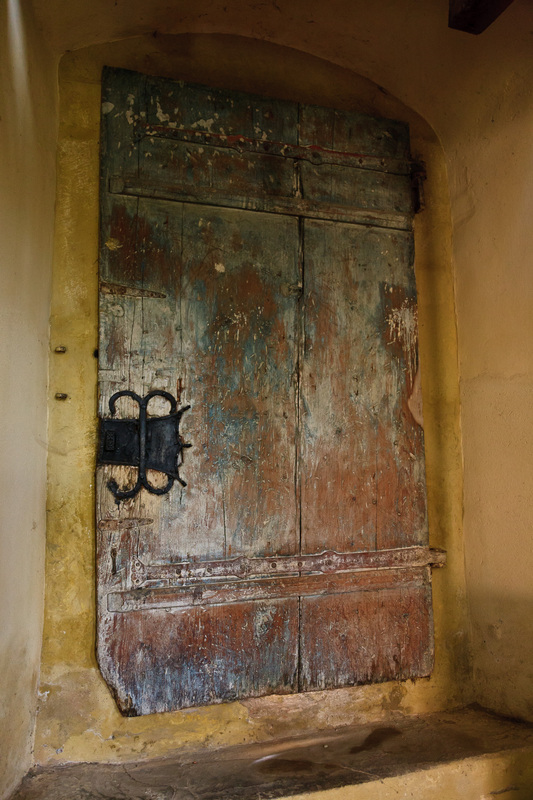 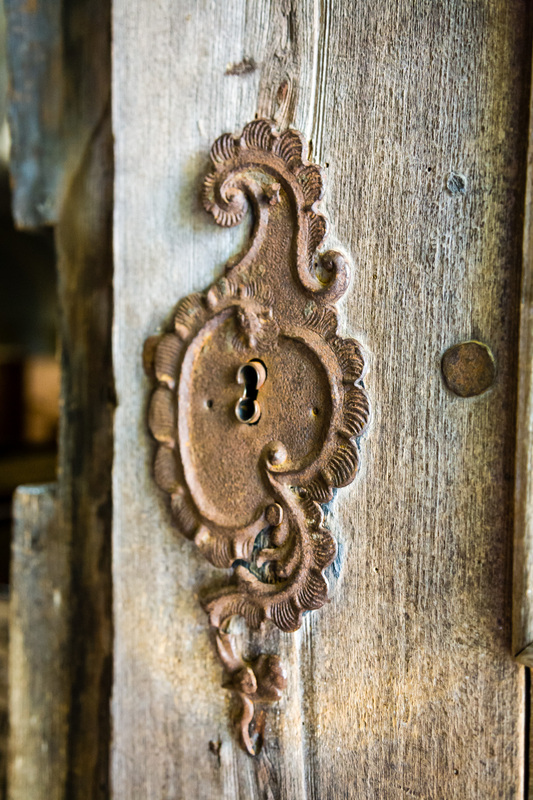 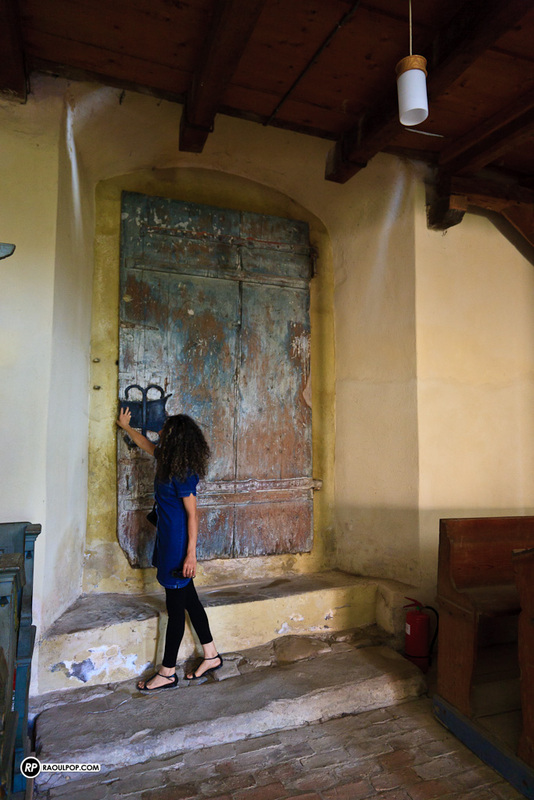 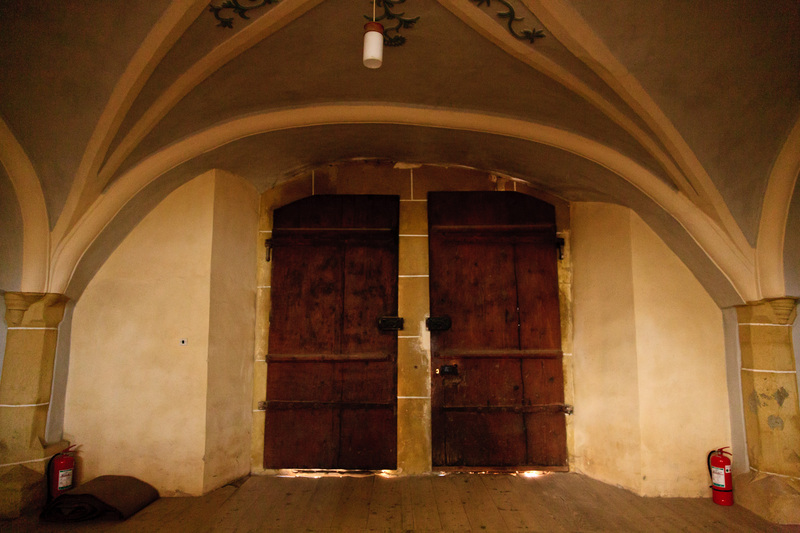 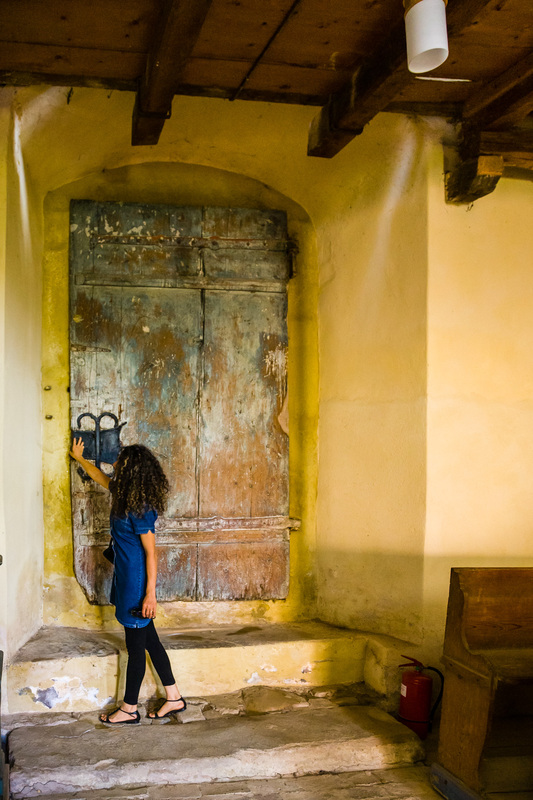 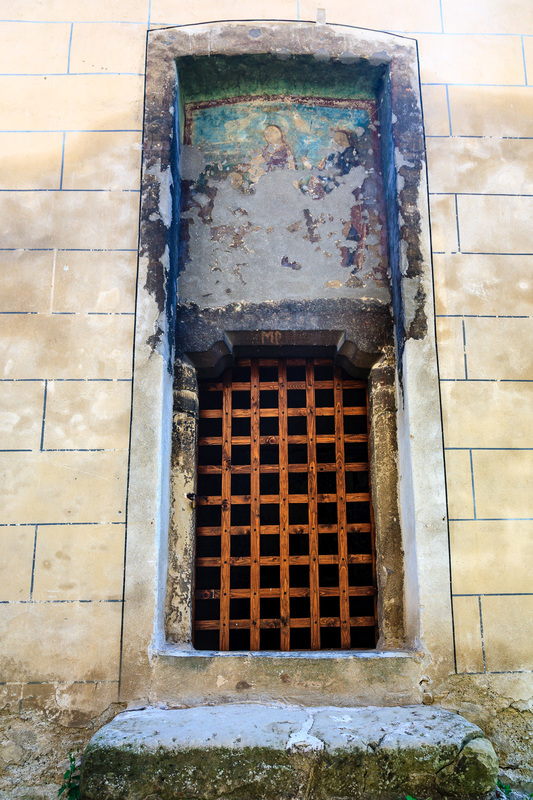 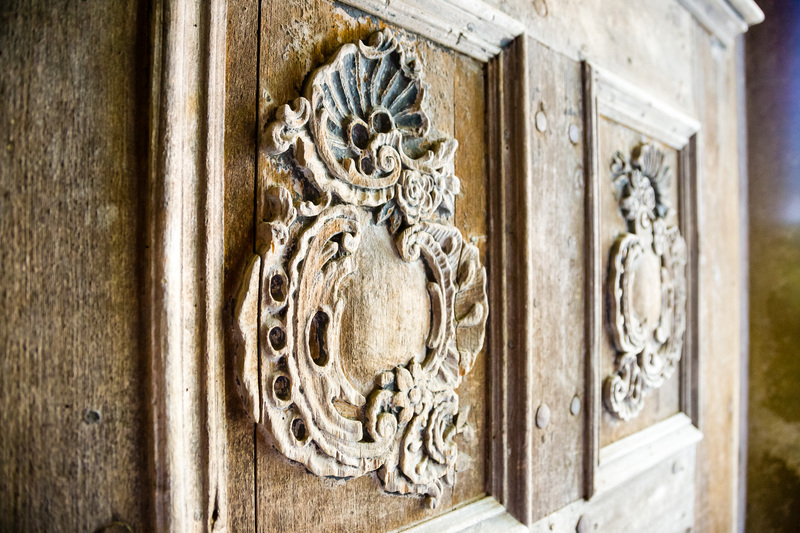 Antique door, fortified church, Biertan, Transilvania, Romania. Doorway inside the church, Biertan, Transilvania, Romania. 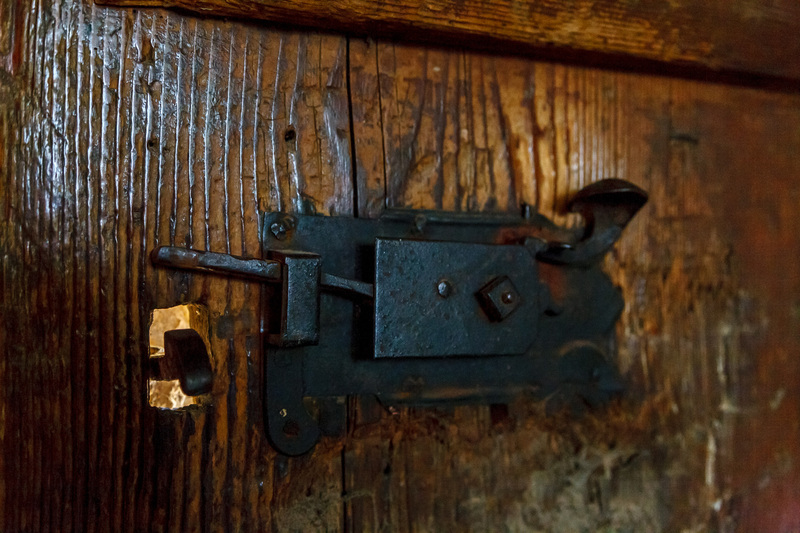 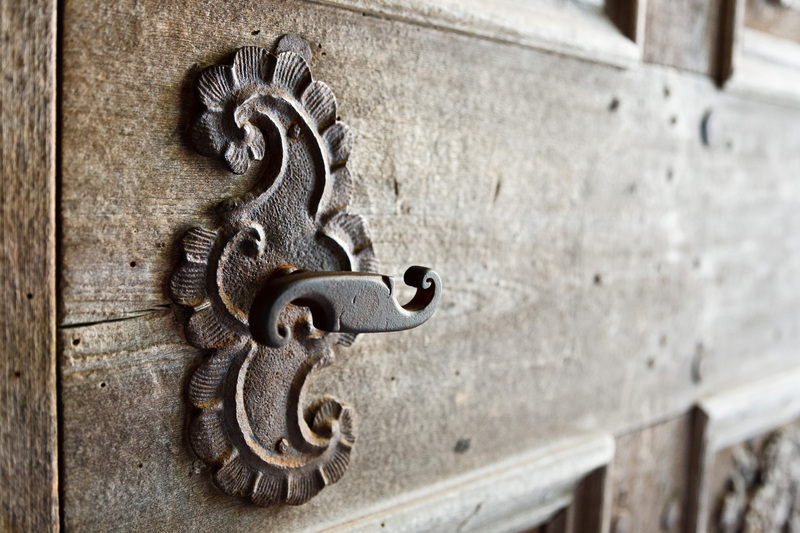 Old door handle, entrance to the church, Biertan, Romania. 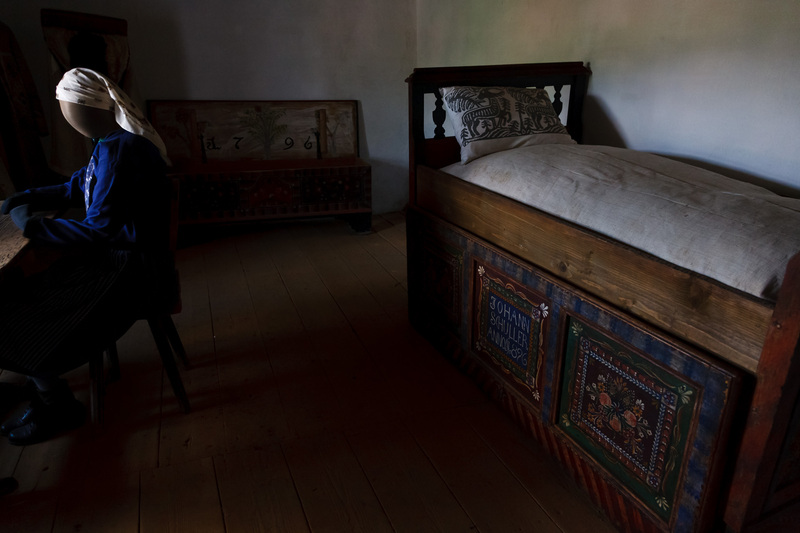 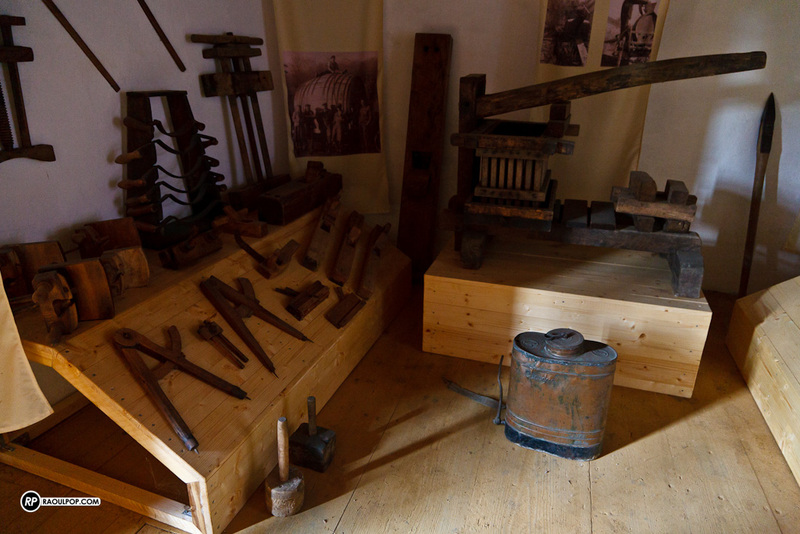 A period room depicting a carpenter’s family life. 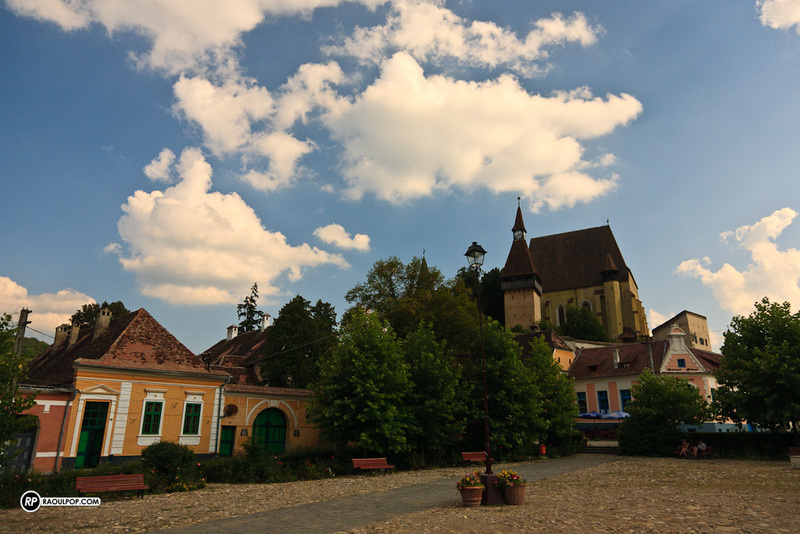 Biertan, Romania. Church entrance as seen from one of the towers, Biertan, Romania. 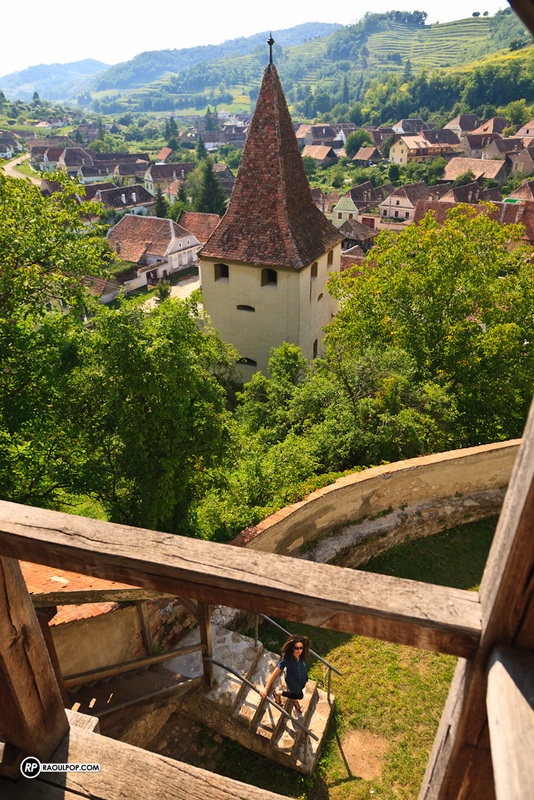 A view of the village from one of the towers inside the inner walls, Biertan, Romania. 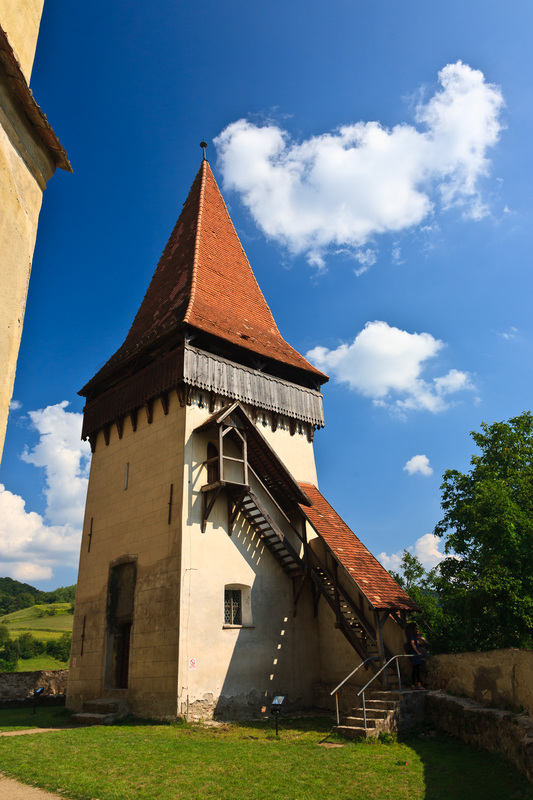 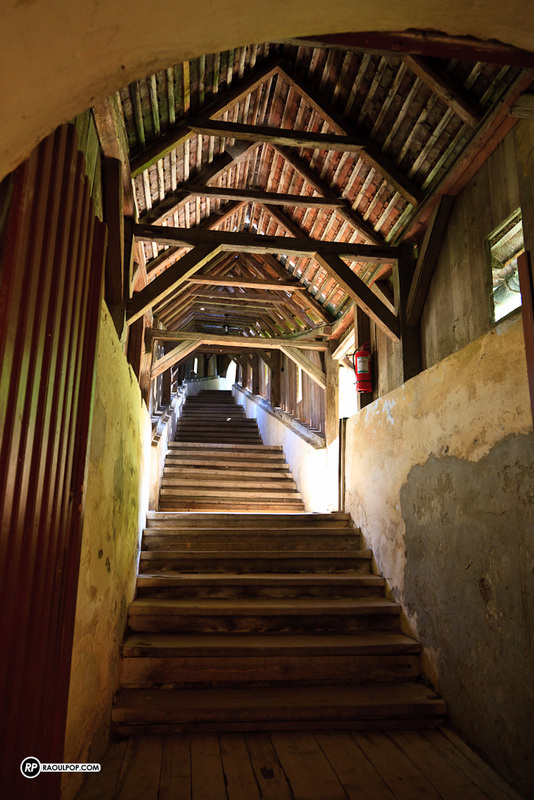 Climbing the steps that lead inside the inner walls, Biertan, Romania. 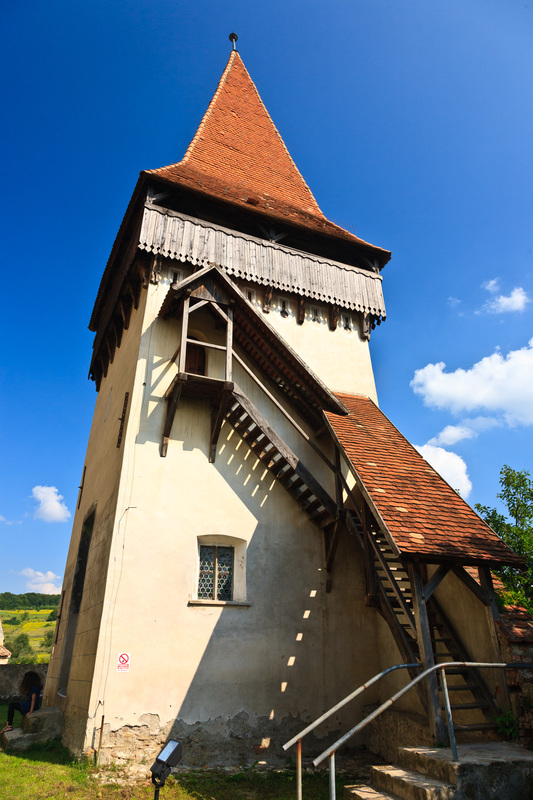 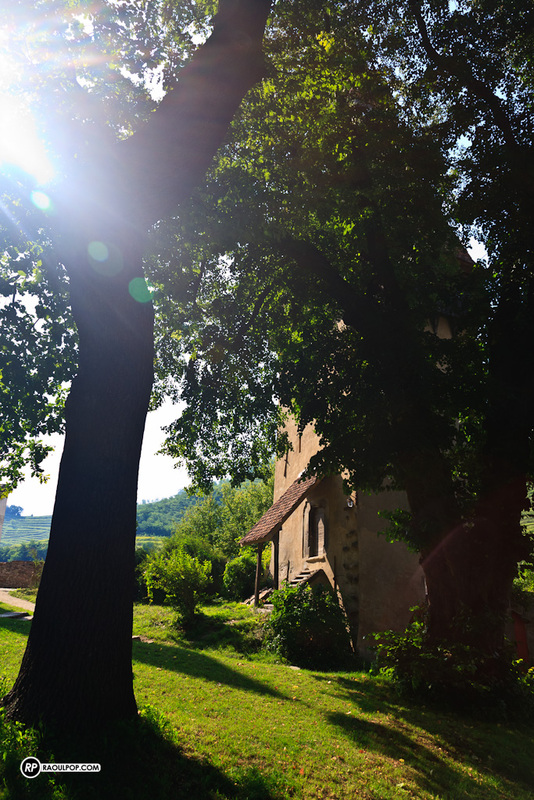 Outside the entrance to a medieval church in the village of Biertan, Transilvania, Romania. 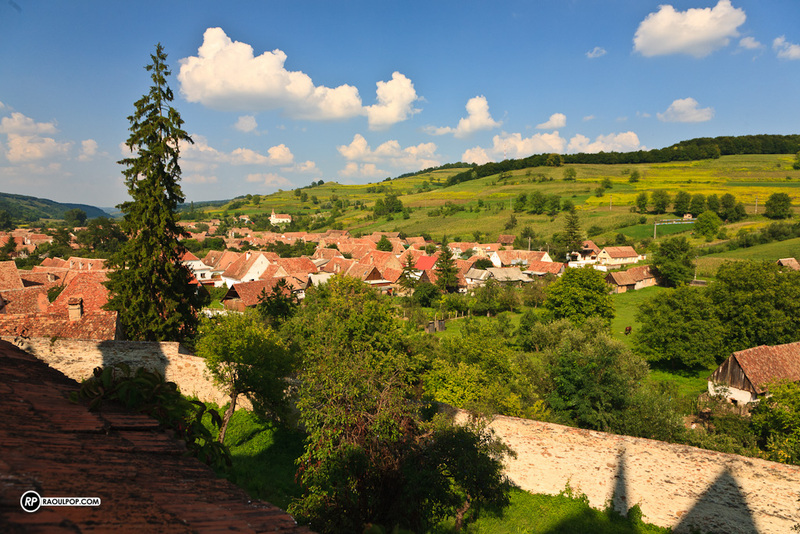 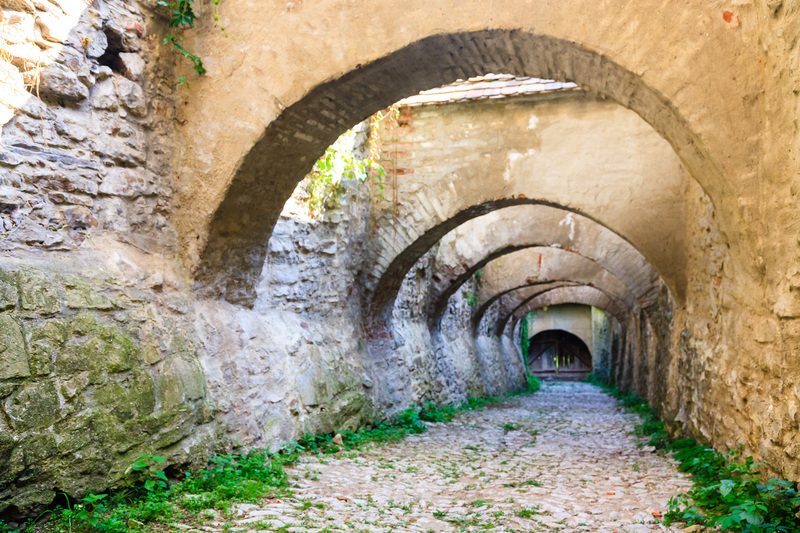 Between the inner and outer fortified walls, Biertan, Transilvania, Romania. 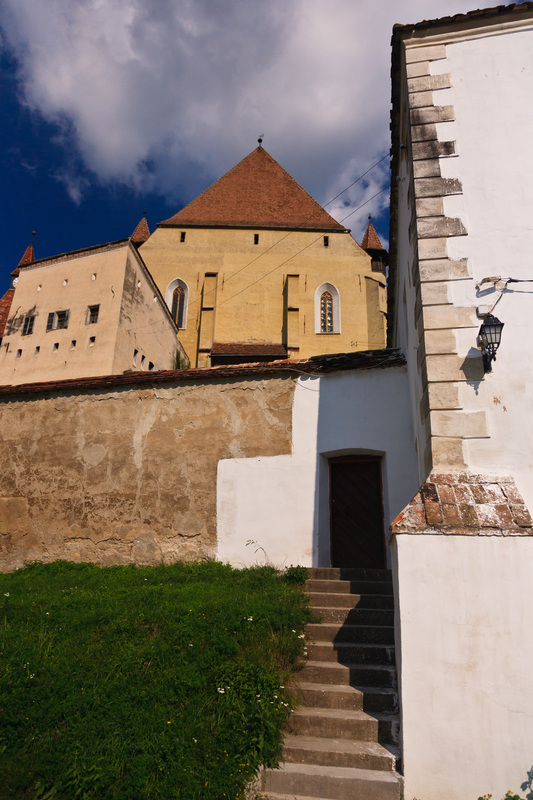 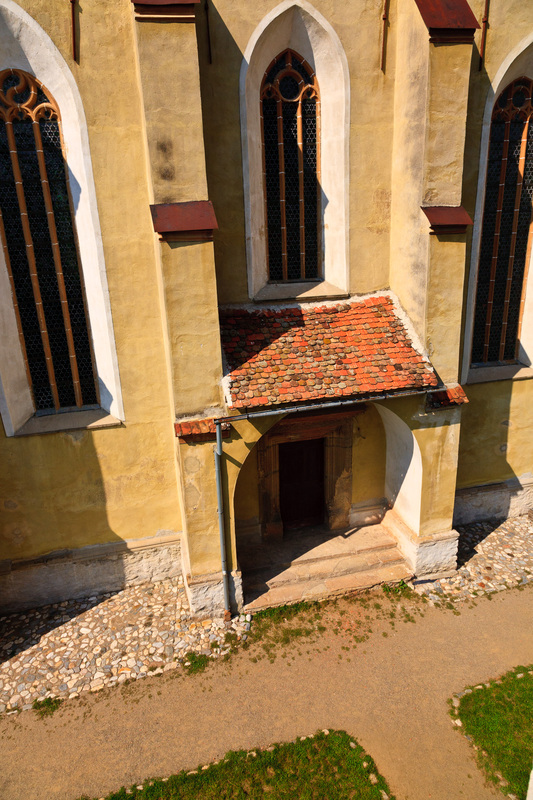 Doorway to the church, Biertan, Transilvania, Romania. Notice the ceiling architecture as well. Interior of the church, Biertan, Transilvania, Romania. Previous Post Win your choice of a Drobo S or Drobo FS – enter now! 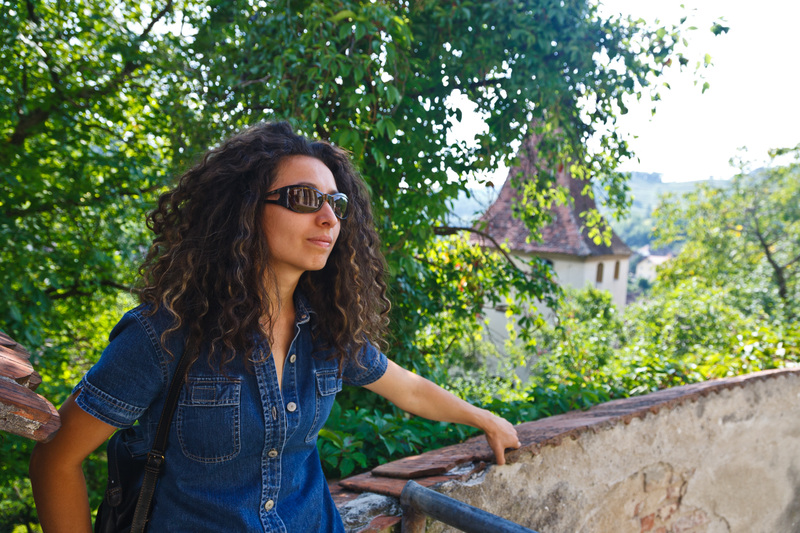 You’re welcome, Tibi! 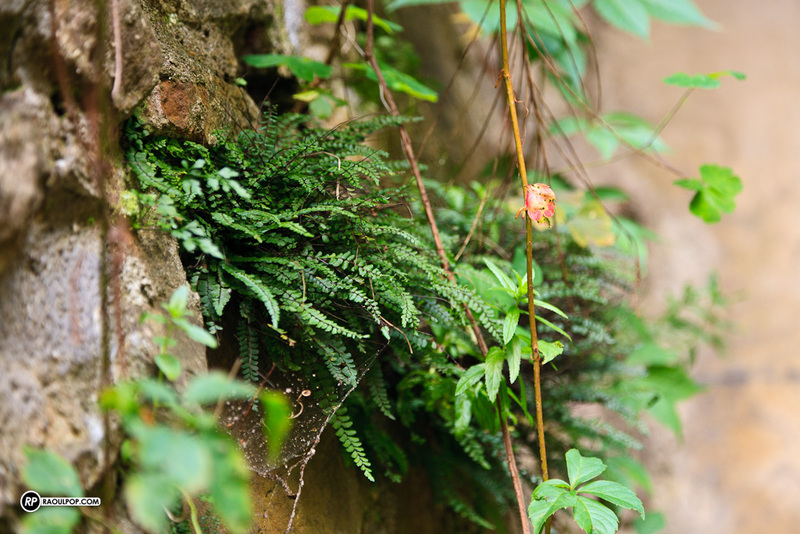 Glad to see you here!